We started our assembly with the invitation, given by Sister Elvia, to take a folder from the floor, look at the name and give it to the owner while doing a small talk to get to know each other. 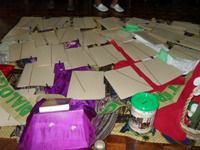 When we finished we lighted an incense stick, put it in a container prepared for that and we had, invited by Anne Beatrice, a moment of silence to pray for the person to whom we have given the folder, and or everyone present in the assembly. Then, we sang the Our Father in Tagalog. After Sister Anne Beatrice gave welcome remarks. When she was done she called Sister Therese Elisabeth to moderate the group for the sharing of experiences. Sister Therese Elisabeth welcomes them with the following words: “Dear friends, we are happy to welcome you and to be welcome by you as well. Today we are going to learn from your experience in life: living in squatter areas, long the river and under the bridge. And how even though you are poor, you can teach us that solidarity is possible, love is possible, compassion is possible, life is possible, we can recognize, grow and help ourselves and others with the solidarity that the CIC have with you in the mission(Emilie’s home, Pastoral Care for Children and Bible sharing). She is married and the mother of six children. She shared how she was motivated to help other during the typhoon Ondoy last September 26, 2009. She said that after putting her own in safety she went back to the place thinking that there were people who needed help and she couldn’t just ignore that. So she went back and get some of the children and swimming got them pout from the place. Married with seven children and pregnant. She share how when suggested by the sisters to look for a new place to rent to be able to move from under the bridge she said she couldn’t do that because she looked like beggar and people wouldn’t believe that she could actually rent a place. She says that people look down at her because her children are all malnourished and she hope people can looked at her as equal. Widow, with four children. 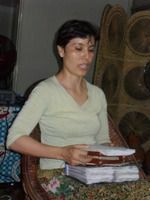 She says that she got the strength to go on from her faith in God and with the help of the sisters she could have a source of income from where she is able to feed her children. She is grateful that one of them entered a scholarship program in Cavite with the Sisters of Mary. She would like that one of her sons, with whom she’s having a hard time now, join the same program so they can accompany each other. She added that now she has no money because she spent everything bringing the youngest son, who has a broken arm, to the doctor. She shared how at the beginning she didn’t experience so much difficulty as both she and her husband had job. But then they lost their job and even their children questioned them about not having all they wanted. She struggled a lot to sell food in her neighborhood because there was much gossiping and intrigues around her. She stood by all that to continue to support her family and her husband who has arthritis. And besides make time to help in the Pastoral Care for Children and to cook the snacks for Emilie’s home children every Monday. Married with four children, three of them girls, and all of them in High School. He collects scrap paper, plastic, metals, bottles...to earn his living. Her wife sweeps the streets and is paid by the Barangay. One of the daughters is in a foster family. This foster family helped him to build again his house washed away by the Ondoy typhoon. He spent only money to buy nails and food for the workers. He ended saying that God always provides and never abandons them. Married with five children she’s sweeping the streets of the Barangay to support her family and her husband collects scrap. She is grateful for the help that the sister give to her for the schooling of her daughter and to the parish for the scholarship of another of her children. And she thanked the sister for welcoming them and being part of their life despite of being part. Married, mother of three children. She shared how before she was thinking only about herself and her family and own interest and earning money. She said that she was judgemental towards others. But then when she entered Pastoral Care for Children everything changed because she learned not only to take care of her children but also to take care of other children and the need of others. She discovered thus that money was not essential but the relationship with others. Married, with four children. 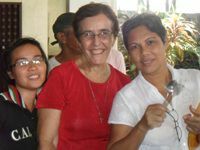 She shared that she could bear to see street children and decided to volunteer in Pastoral Care for Children and help in her own little way to relieve the poverty and needs of others. She says that she can look for a job but she prefers to dedicate her free time to help others. She likes to apply her knowledge of the herbal medicines. She told us how when her son had fell down and hit his head an she applied ointment and pray hard to God for him to heal as she doesn’t have the means to bring him to the hospital. All of them were very emotional while sharing. All of them cried and showed their hardship very openly. We were all touched by their sharing. When they finished we gave a big applause. After that sister Ane Beatrice invited us in dyads about our feelings about their sharing, poverty and hardships. Most of these intervention were translated from Tagalog into English by Rea Rtiche J de Arao (novice). When, we finished Mrs. Menchie Bugo and Mr. Eduardo Quijano, head of the social service development ministry, shared about their own experiences, and how they were touched by the stories of the others. The two have made option to help others even giving up opportunities for themselves to be able to help others. Mrs. Menchie living in Saint John Community and Mr. Quijano closing down the store to attend to the activities in the parish and to coordinate the social service. After this we had the morning break and we came back to listen to the lay people from Daet. Camarines Norte. This time it was Sister Terezinha Kunen who introduced them to the assembly after Sister Anne Beatrice called her for that. She welcomed them and let them to introduce themselves. Native from Bicol but the family moved to Manila for the studies of the children. He began by telling us about his dyad sharing with Mrs. Mina Soriano, our neighbour who welcomed the sisters here in manila back in 2001 and helped them a lot at the beginning as she was familiar with the house for she was close with the Siervas de San Jose former owners of the house. 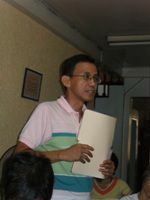 Then he continued to share about his family background, learnings and his experience in PCC (Pastoral Care for Children). He studied geodetic engineering, worked for some time on his field, realizing how many Filipinos do not own any land. Then he did a Master in Economics and made a research on the poverty in the Philippines to do this he went to his native Bicol. He first encountered the PCC when sister Terezinha Kunen asked him to help her to make a project to ask fund to Pondo ng Pinoy for the PCC. As she insisted he became interested had to learn everything about the PCC and he said that he was shocked when he knew about the pastoral’s systematic organization of the community and how the food supplement was made. Mrs. Tess began by giving a brief historical background on how the sister arrived to Daet. 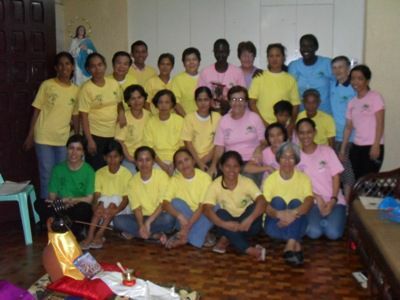 First they did a missiology course in Zamboanga City where they met Fr. Dennis Remot who introduced them to Bishop Benjamin Almoneda, emeritus bishop of Daet. The bishop being himself very sensitive towards the poor liked the objective of the mission of the sisters of care for the poor and for a better quality of life for them. Her own encounter with the pastoral began with the interest to learn about herbal medicines. She explained how her interest was just about that and she ash to endure the whole seminar patiently to get the diploma. At the end she was elected coordinator of one group of leaders and this way her commitment with the pastoral started up to being today the president of the association of Pastoral care for children as registered NGO. She added that she is grateful to the CIC sisters and that they cannot go any more on asking but need to learn to stand on their own feet. She explained how the livelihood project with ten women in Daet, Camarines Norte is being quite successful. She ended saying that the CIC are identified as those who celebrate life and bring spiritual and human transformation to the people. 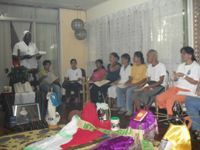 Mr. Eduardo Quijano intervened during Mrs Tess’ sharing to ask if there can be the possibility of having the help of Mr. Louie Molina with the regularization of the “Miraculous Ointment” as other parishes of the diocese of Cubao would like to also have access to this livelihood program. There were various opinions about it and we closed it, since this need a special meeting. Sister Therese Elisabeth gave thanks to the lay people coming from Daet and for their sharing welcoming them again in our midst. We continued the morning with a presentation of Mr. Louie Molina about the history of the Filipino. He spoke about two keys to understand the Filipino People: their history and geography (See Attachment 2 for a synthesis of his presentation). We have to cut the talk of Mr. Louie to eat a delicious lunch and rest for some time. We resumed again our assembly at 2:30 pm. Mr Louie finished his presentation leaving us all with a new understanding of the Filipino culture and idiosyncrasy. We continued the afternoon with a sharing in small groups on the Gospel of Luke 14:25-33. Our reflection focused on our strengths/ opportunities and on our weakness/ threats when it comes to commitment to solidarity action. We had 5 groups and each group was able to come about with a list of both strengths and weaknesses. We had our plenary (See attachment 3) after a enjoying a very delicious “pancit.” Mr. Louie Molina moderated and assessed the work done. He explained how unlike companies which used this very scheme to prosper and increase their effectiveness and economic success we were able to arrive to a list not only about exterior and interior strengths and weaknesses but also to the discovery of those in ourselves which companies certainly do not do. From here, he concluded we can plan or see and reflect about Pastoral Care for Children as knowledge has be followed by attitude. We ended our day with moment of prayer led by the community of Daet. Sister Terezinha gave an introduction about how we need to remove our sandals to step on this land of the Philippines as it is sacred ground. She also mentioned the bamboo tree as a symbol of the resilient spirit of the Filipino, that capacity of to endure difficulties without breaking down and even joyfully. We finished with the Our Father and then we thanked and say good bye to the lay people who joined us today, leaving their occupations and even their children to stay with us the whole day.